AVAILABLE FOR SPRING ORDERS ONLY. Please place fall and spring orders separately. 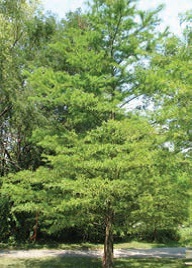 SEASON:CONIFERS ARE FOR SPRING ORDERS ONLY. NO CONIFERS ARE DISTRIBUTED IN THE FALL. Tree loses needles every fall and grows new ones in the spring. Very long lived tree, seed is good wildlife food, provides good wildlife cover. Wood is very decay resistant.